On a computer, go to Feature Add-ons > Time Clock Kiosk. At the left, click the kiosk name. In the Edit Kiosk window, under REQUIRE PHOTO ON CLOCK IN/OUT, select Yes > Save. On the kiosk device, PIN in, PIN out, and PIN in again. A message displays asking for permission to use the device's camera. Follow your device's prompts to grant the permission. 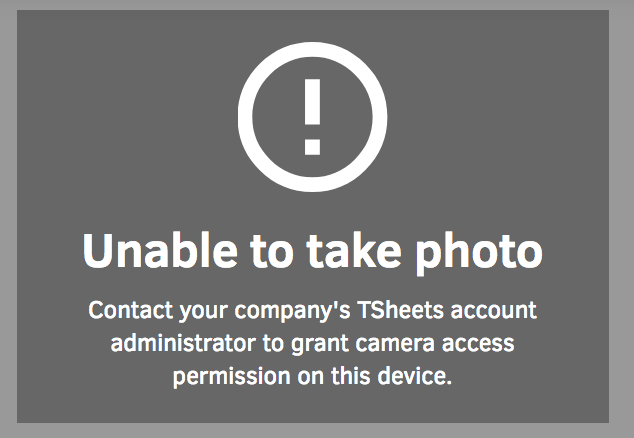 Unable to take photo: Contact your company's TSheets account administrator to grant camera access permission on this device. This means the device has the correct setup, but the device's camera permissions were disabled. 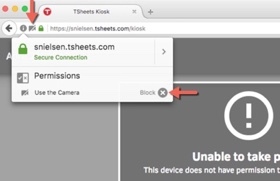 Unable to take photo: Contact your company's TSheets account administrator to make sure that this device has the right software or hardware to take a picture. This means the kiosk may be running on a computer/tablet without a webcam or on an unsupported browser/device. In all cases, the hardware must have either a built-in or accessory webcam. On a tablet, re-download the TSheets Kiosk app. On a desktop, access Kiosk through the latest version of Chrome, Firefox, or Edge. We can't determine if this device's camera permission has been granted. This isn't really an error state, just a notification to let an admin know the camera has not been set up. Kiosk is unable to take photos because your device's camera permission has not been granted. This device may not have a webcam or may be running on an unsupported browser. Learn which Android operating system version you have by going to: Settings > About Device > Android version. For Android 5 (Lollipop): When you install Kiosk, you will be asked for permission to use the device's camera. If you grant the permission, Kiosk will install. If you do not, Kiosk will not install. For Android 6 (Marshmallow) and up: When you first use Kiosk, you will be asked for permission to Deny or Allow use of the device's camera. Select Allow. 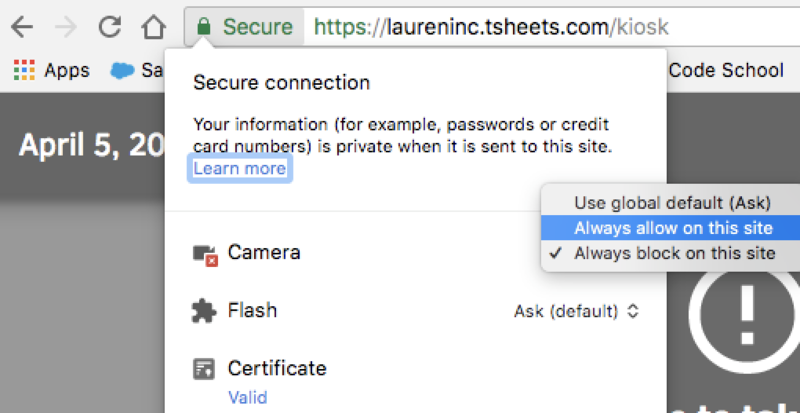 If permission was previously denied, on your device, go to Settings > Applications > TSheets Kiosk > Permissions > Camera to grant the permission. On your iOS device, tap Privacy > Camera > TSheets Kiosk. To enable access, tap the toggle button on (green). You may need to refresh the page after the changes are made. Click the camera icon. A Permissions menu displays. To clear the setting, click Block X.
Refresh the browser page. You will be prompted to set the camera permission. Safari does not support camera permission. Instead, if clocking in from a computer, access the app from Chrome. Or, from a mobile device, download the TSheets Kiosk Android or iOS device app. In Kiosk, if this message displays: "Let [name] use your webcam?" instead of clicking "Allow once," click "Always allow."